MG MGF MGTF TF F REAR BRAKE FLEXI HOSE X2 VVC 160 115 135 SHB000880 OFFER!! 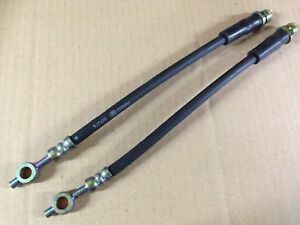 MGF MG TF FRONT BRAKE FLEXI HOSE X1 VVC 160 115 135 SHB000870 OFFER PRICE! MG MGF MGTF TF F REAR BRAKE FLEXI HOSE VVC 160 115 135 SHB000880 OFFER PRICE!! MG Mgtf Tf front brake Flexi Pantalon x2 VVC 160 115 135 shb000870 Pair OFFER! Please note, for delivery purposes customers are required to supply a contact telephone number.